After finally deciding to replace an aging WRT54GL, I decided to not get a typical poor-performing home router and go for a more professional product. The RouterStation Pro fit my needs perfectly, with its expandability and performance being far beyond most home routers. Read on for the review and pics. 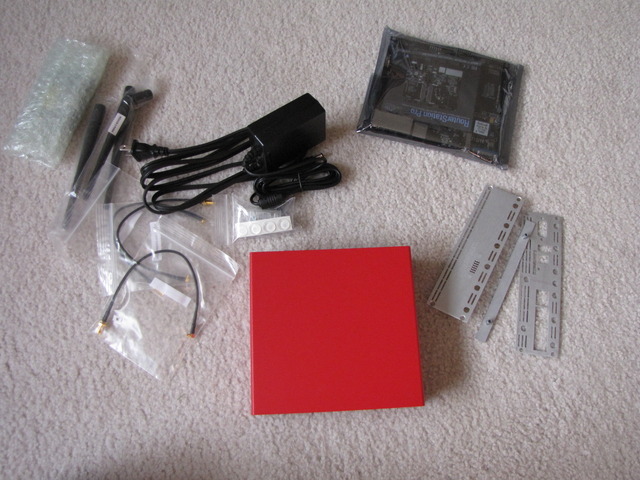 I ordered the RSPro kit V2 and the SR71-A kit from Netgate. The kits are not pre-assembled, so some work is required. Basically, the procedure involved attaching a mounting bracket, removing the old serial port screws, then securing the back plate on with new ones. You then would install the card and pigtails. After that, you just have to slide the assembly into case, screw the back panel on, and then install the front panel and light guide. The default software on the router was OpenWRT, but not the latest version. I decided to update to the latest stable Backfire, 10.03. However, the SR-71A was not recognized. Updating to 10.03-rc3 solved this problem, and the radio was usable. The router’s CPU blows away typical home routers, with a stock clock of 680MHz (some other sources report 720MHz). In addition, there are four gigabit ports with the WAN port being on a separate interface and supporting PoE. The router requires 48V DC power, which can be supplied through either the dedicated DC-in jack or through the WAN port. 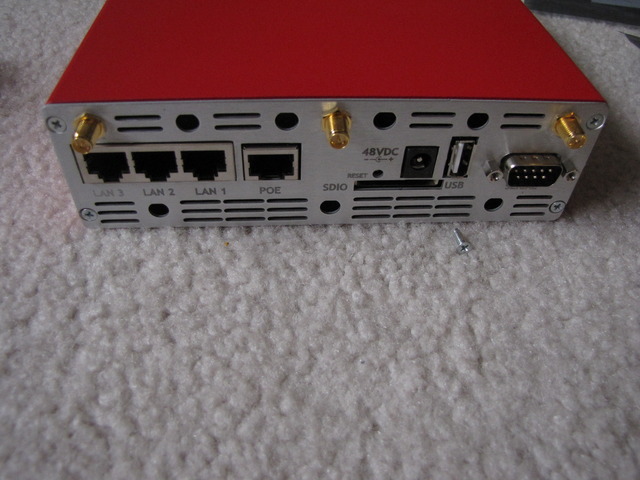 The back of the router is where all the interesting stuff is. People who want to add serial ports to their routers often have to go through a bit of work to install one, but this box has one built in. In addition, it has SDIO and USB support built in. 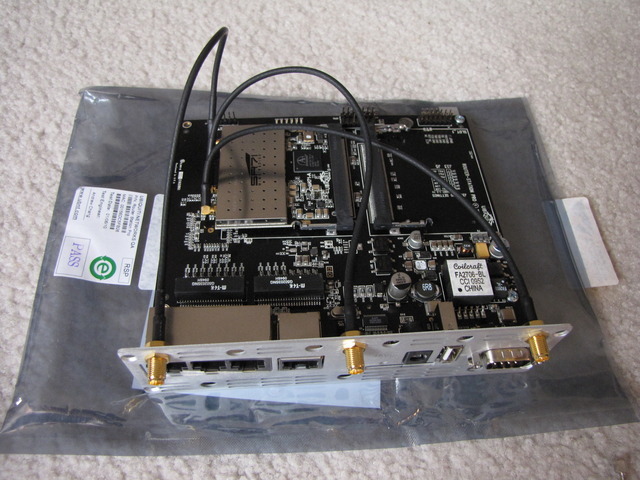 SDIO can be used for anything from Wifi cards to GPS receivers. There are 10 antenna holes on the back, and 6 on the front. The antenna holes are SMA/RP-SMA-sized. There are three mini PCI slots, which can be used for WLAN cards or other peripherals such as storage controllers and crypto accelerators. There are even mini PCI Ethernet cards available, if four ports aren’t enough for you. 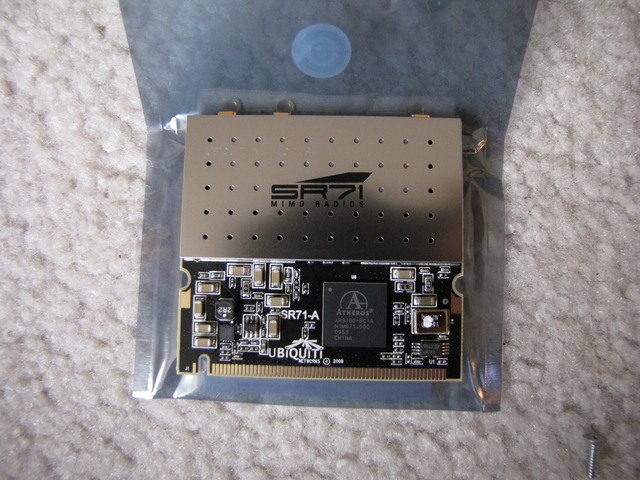 My card of choice, the SR71-A, supports 2.4GHz and 5-5.8GHz, with a transmit power of 24dBm. One particular problem I had was the regulatory limitations placed on certain channels. The SR71A supports both 2.4GHz and 5GHz (not simultaneously) but many of the 5GHz channels are limited to either 17dBm or 20dBm due to regulations, compared to the 27dBm limit on the 2.4GHz range. When I tried to use the 2.4GHz band instead, I was unable to use a 40MHz channel width due to too many other APs, so I couldn’t get more than 144mbit/s theoretical on 2.4GHz. Using the 5Ghz range solved this problem, but I had to use the highest channels (Channels 149-165) in order to use higher transmission power. My laptop (with Intel 6300 wifi card) could easily get over 60mb/s from upstairs, and it achieved over 100mbit/s while near the router. Despite the great performance, in hindsight, I would have probably gotten the SR71-15 instead, a 5GHz-only card, which has more transmit power. In addition, the tri-band antennas have decent gain (5dBi on 5GHz) but there are single-band antennas of much higher gain. Since the card only supports one band at a time, you would need separate antennas anyway if you wanted simultaneous dual-band because you would you need to use two cards. The RSPro has support for three cards, so you could easily do a simultaneous dual-band system by using a 2.4GHz card and a 5GHz card and you would still have a slot left over for whatever else you wanted to do with the board. I don’t have any major problems with the device, but I have some small concerns. First of all, many of Ubiquiti’s other products have sufficient LEDs on the front, usually the standard stuff, plus a signal bar. 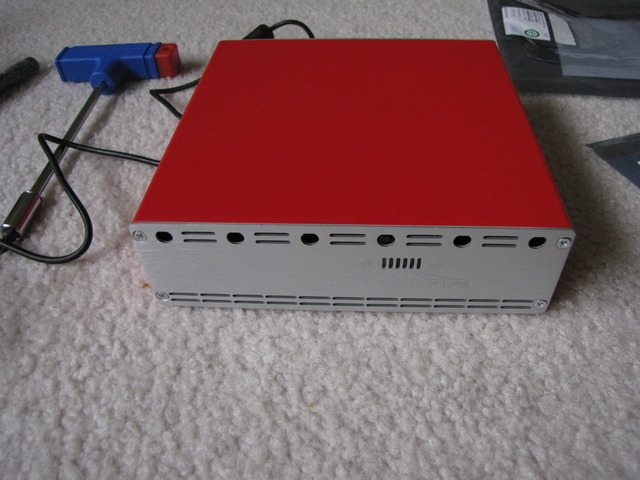 The RouterStation Pro only has a power LED, Ethernet LEDs, and one RF LED. One RF LED would not be sufficient if you would like to use more than one wifi card, and wish to have one LED for each card. For comparison, the WRT54GL has a programmable power led, DMZ LED, WLAN LED, and two different colored LEDs behind the Cisco logo. Secondly, the SR-71A is not officially supported, and is not supported in the stock firmware, as of writing this. This is kind of disappointing to see Ubiquiti’s best card not being officially supported on their own device, especially when I was able to get it to work simply by updating the firmware. Lastly, there appears to be some kind of bug with either ath9k or some other part of OpenWRT. After a while (sometimes hours, sometimes days), any wireless clients will lose connectivity to any routed networks. They can still connect to bridged hosts, but not any outside hosts. Running ‘wifi’ fixes this (temporarily). Overall, it is a pretty nice board, and is a better value than most of its competitors. This entry was posted on Saturday, April 2nd, 2011 at 10:08	and is filed under Uncategorized. You can follow any responses to this entry through the RSS 2.0 feed. You can leave a response, or trackback from your own site. Thanks for this, you convinced me to order up an RS Pro :) Also, really really digging the RGB LED mod, going to have to do that one! 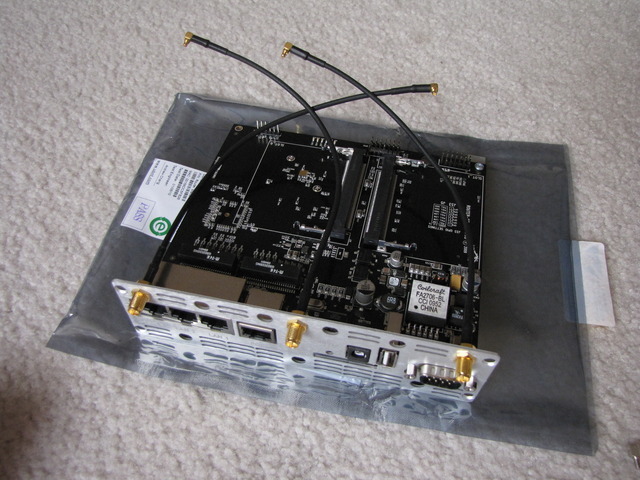 I’ve got a Routerstaion Pro with SR71-15 mini PCI card and I cannot get it working with OpenWRT – OpenWRT seems to have issues with 5GHz at the moment. I’ve heard that the card is firmware loaded to the US which causes all sorts of issues with DFS. I did find you can replace the /usr/lib/crda/regulatory.bin file though which seems to help but I still cannot get it working properly. I’m thinking of asking Ubiquiti if there is a UK, Europe or non North American firmware available. I like the case you have – I got a plastic one from Germany but it’s not on the same scale as that – yours has tones of SMA aerial holes available plus the aluminum would really help with cooling. Which version of OpenWRT are you using? One of the recent release candidates broke 5GHz support but another one fixed it. I ran RC3 then RC6 and they both seemed to work on 2.4 and 5, although RC6 gives much better performance. I know this is late, but NetGate (among others) seems to be out of RS-Pro kits. Also looks like Ubiquiti has EOL’d their RouterStation boards altogether. Any idea for a new source of these? I don’t know of any but you might be able to find some smaller sellers or use eBay. Unfortunately, Ubiquiti does not have a replacement out yet, but they seem to be working on a router device. In the meantime, there’s Microtik board with similar specs (but higher prices) and other brands like Gateworks and Soekris. Well, I’ve still not got 5Ghz wireless working properly. I’ve basically tried from RC4 to 10.3.1 of Backfire with little to no success. I’ve only just recently worked out how to TFTP this board after having a kernel panic on the board. After getting the SR71-15 I found I’d bought a US version rather than world version. The FCC labels kind of confirm this. I found a world version available in Australia but don’t like the idea of our customs fees just essentially for a differently burnt EEPROM. I’ve managed to also get OpenWRT on my old Netgear DG834GT which is really nice. Seem to get a really fast wireless network now with higher signal on it. Only thing is the Netgear DG834GT uses Broadcom chipset but as OpenWRT don’t have a driver for the ADSL this has kind of killed my abilty to use it as a backup router unless I reflash it back to Netgear’s firmware. That’s strange, it should have been fixed. If 5GHz isn’t working at all, you should ask on the OpenWRT forums or submit a bug if you can’t get it fixed. The regulatory controls are always a pain to deal with. You’d think there would be a simple setting for reg domain, but nope. There is one in LuCI, but I highly doubt it works. I’ve compiled Backfire with the CONFIG_ATH_USER_REGD=y set via make menuconfig (not by text editing), put a hacked regulatory.bin in place but it still won’t work. Signal is shown as “Signal: 0 dBm”. Thinking of compiling trunk with CONFIG_ATH_USER_REGD=y and a hacked regulatory.bin but I’ve had issues with Luci not working in the past (always a bit of an issue when ssh isn’t working too – seems not to be an issue if you keep the previous setting but a issue if you drop them when putting on a new image). site, it consists of priceless Information. I visit each day a few websites and blogs to read content, however this weblog gives quality based writing.